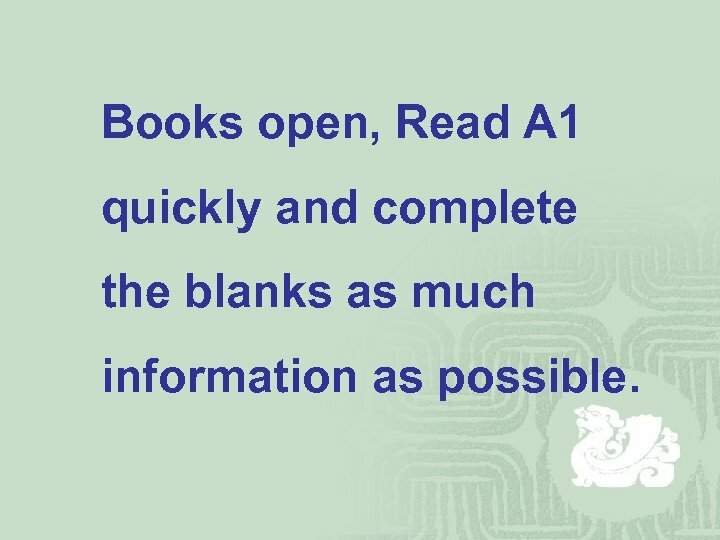 Books open, Read A 1 quickly and complete the blanks as much information as possible. Listen to Detective Lu’s interviews with the two suspects. Then help his assistant complete their profiles in Part A 1. 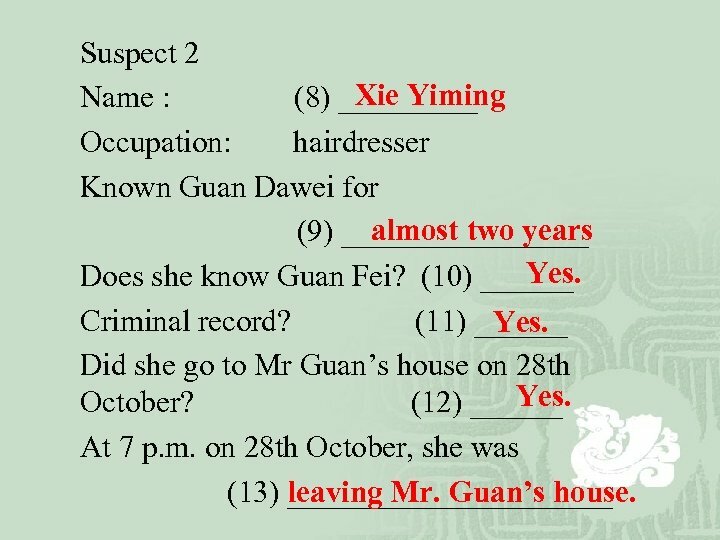 Suspect 2 Xie Yiming Name : (8) _____ Occupation: hairdresser Known Guan Dawei for almost two years (9) ________ Yes. 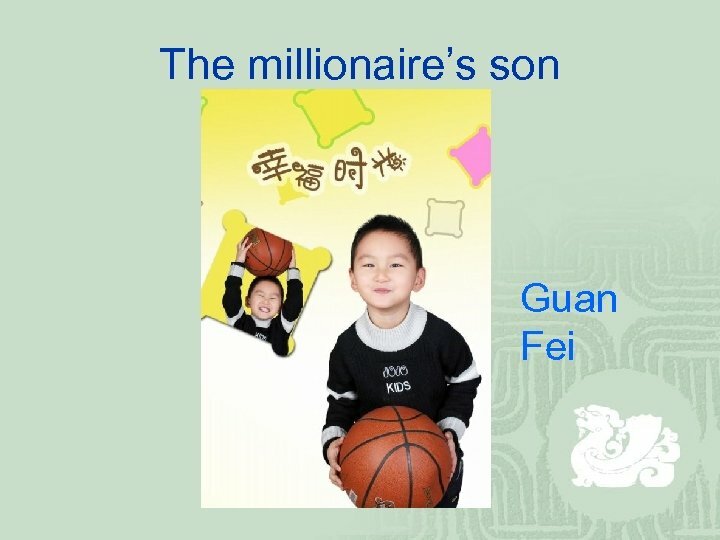 Does she know Guan Fei? (10) ______ Criminal record? (11) ______ Yes. 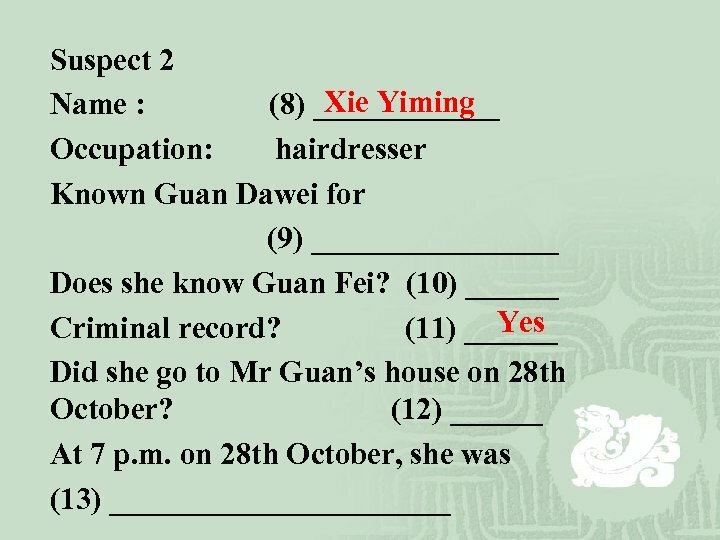 Did she go to Mr Guan’s house on 28 th Yes. October? (12) ______ At 7 p. m. on 28 th October, she was (13) ___________ leaving Mr. Guan’s house. 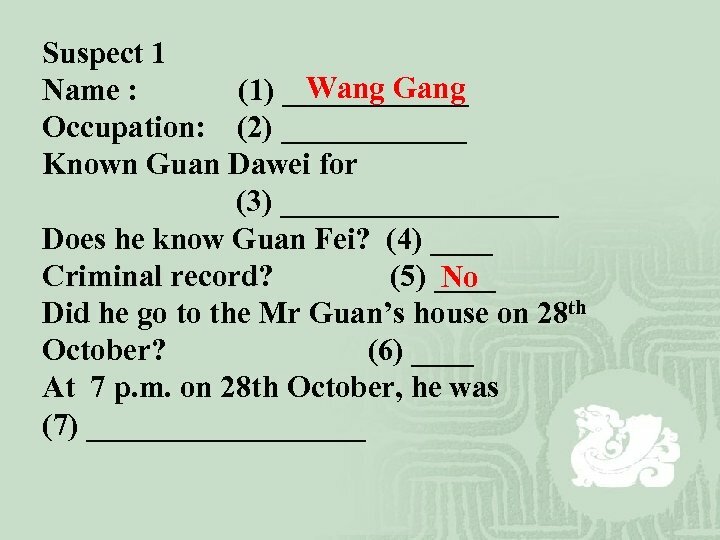 Wang Gang Our first suspect is (9)______. 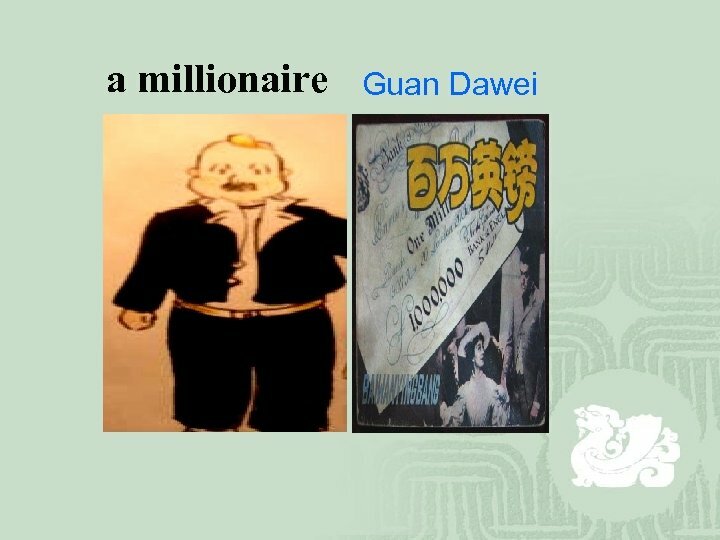 He is a (10)_____ and has known postman about 7 years Guan Dawei for (11) ________. 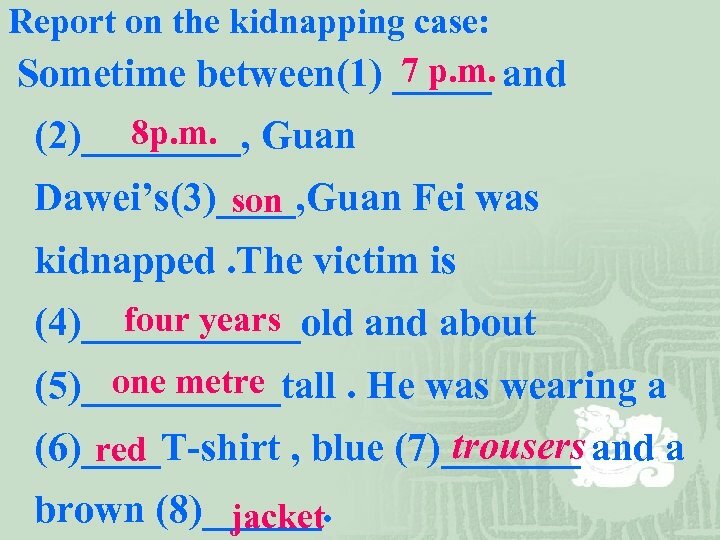 However , he (12) _____ know the does not boy who was kidnapped. 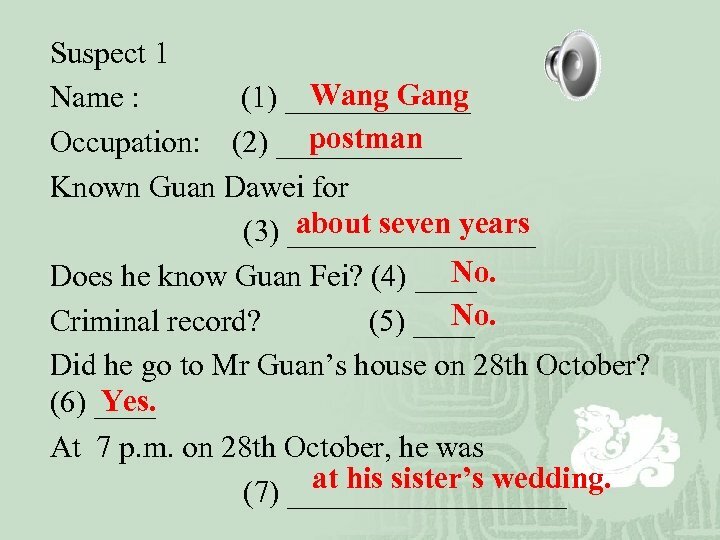 He went to Guan’s house on the morning of 28 th October (13)______, But in the evening he his sister’s wedding was at (14)__________. 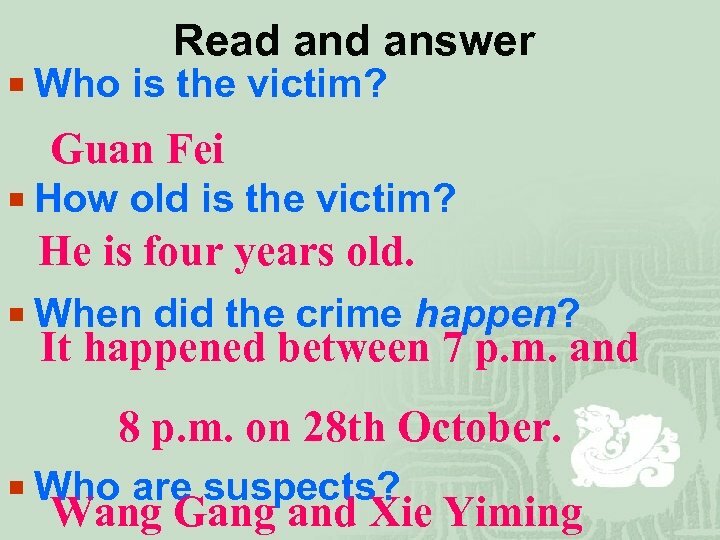 Our second suspect is Xie Yiming (15)________. 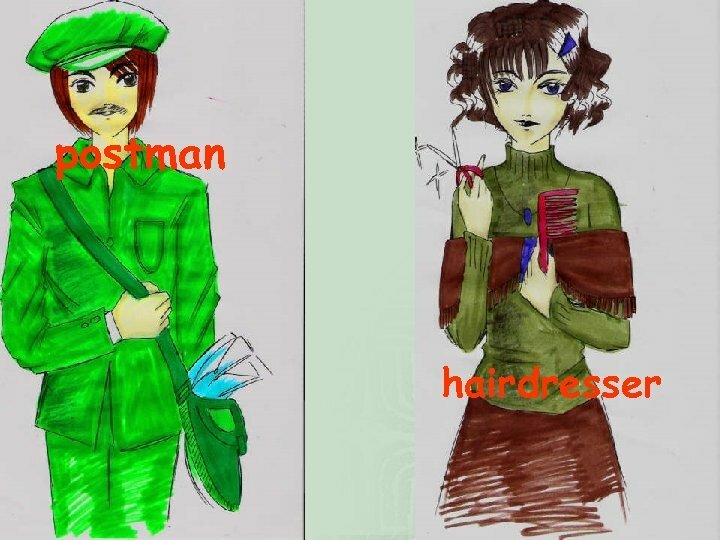 She is a hairdresser (16)______ and has known Guan almost 2 years Dawei for (17)_______. 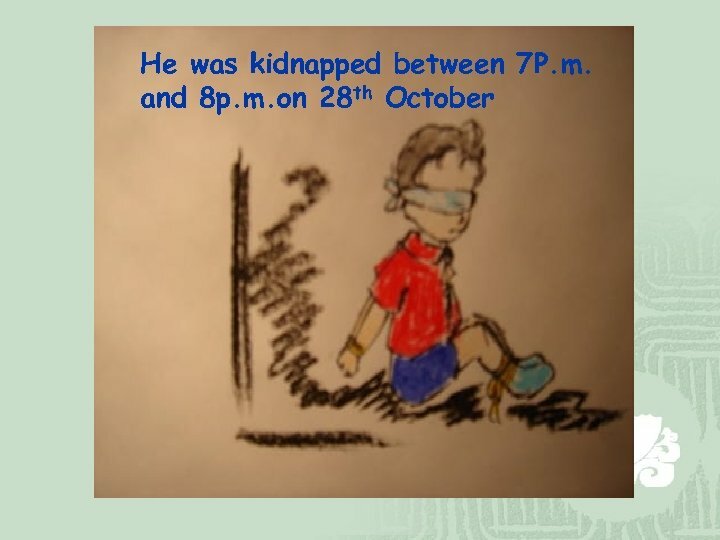 She knows (18)_____ the boy who was kidnapped. She went to Guan’s house 28 th on(19)____ October , and left the 7 p. m. house at (20) _____. 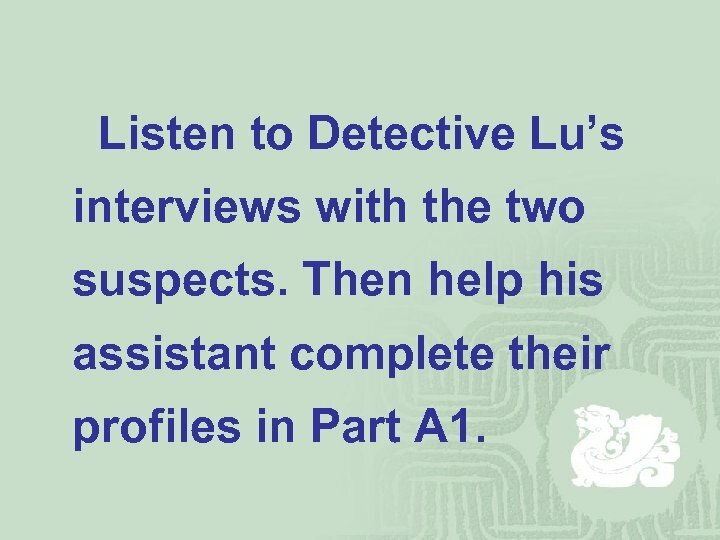 Listen to Detective Lu and Policeman Li’s conversation and try to answer the following question. 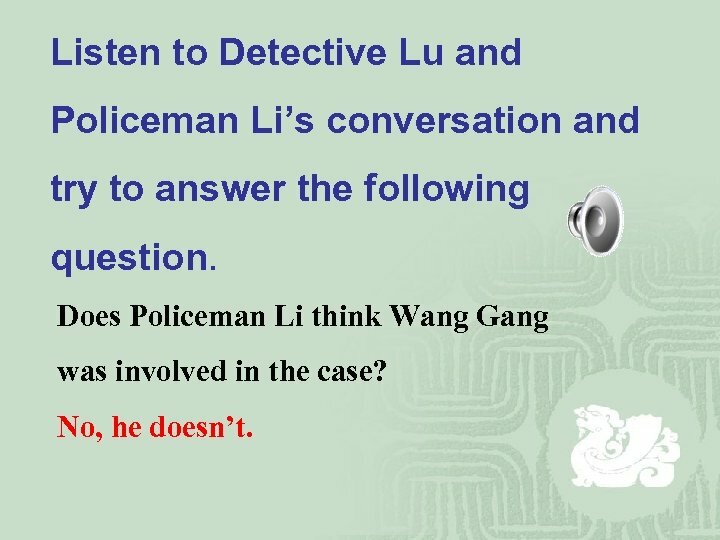 Does Policeman Li think Wang Gang was involved in the case? No, he doesn’t. 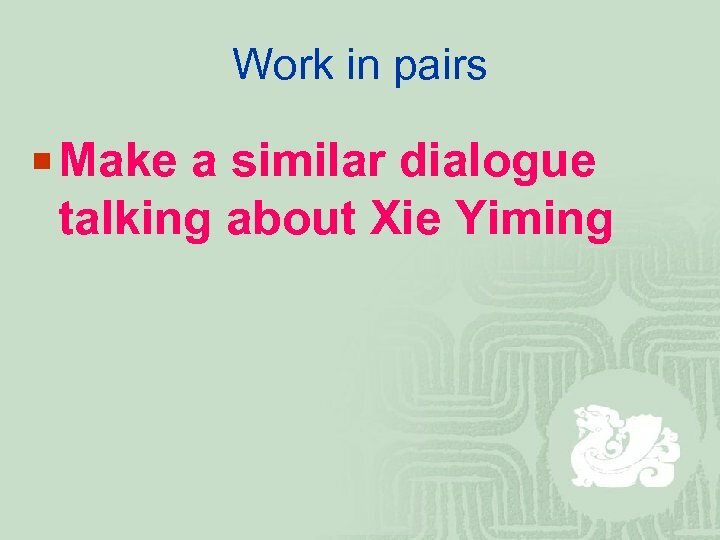 Read the dialogue in pairs together. 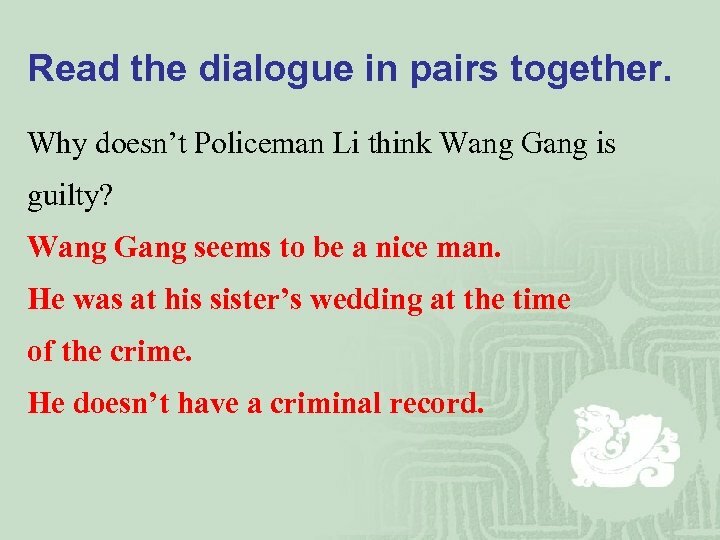 Why doesn’t Policeman Li think Wang Gang is guilty? Wang Gang seems to be a nice man. He was at his sister’s wedding at the time of the crime. He doesn’t have a criminal record. ¡ 1. 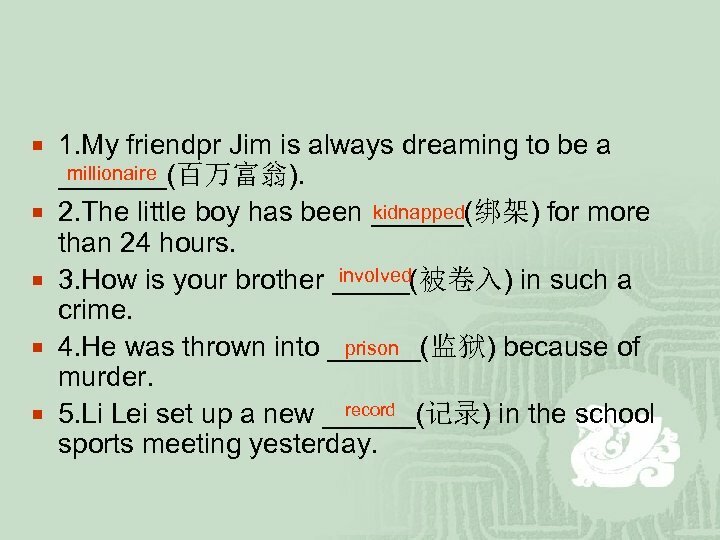 My friendpr Jim is always dreaming to be a ¡ ¡ millionaire _______(百万富翁). 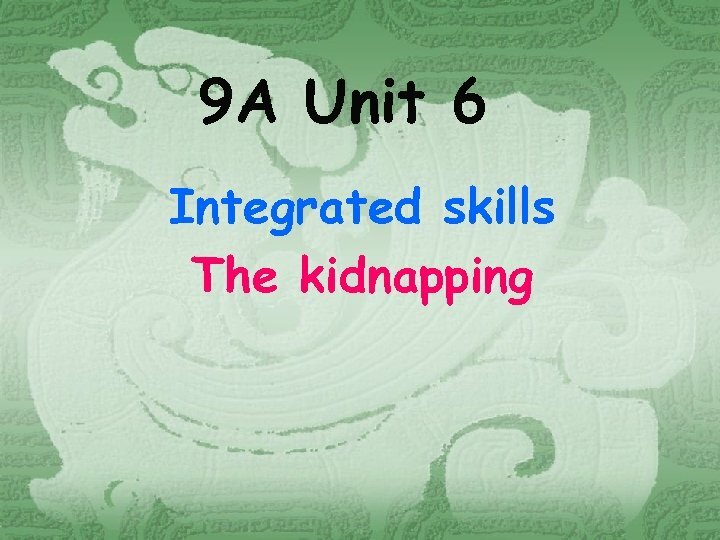 kidnapped 2. 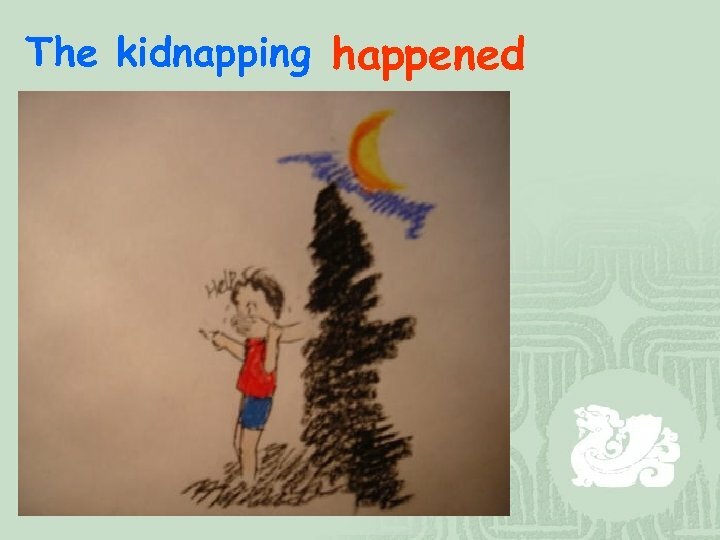 The little boy has been ______(绑架) for more than 24 hours. involved 3. How is your brother _____(被卷入) in such a crime. prison 4. He was thrown into ______(监狱) because of murder. record 5. Li Lei set up a new ______(记录) in the school sports meeting yesterday. 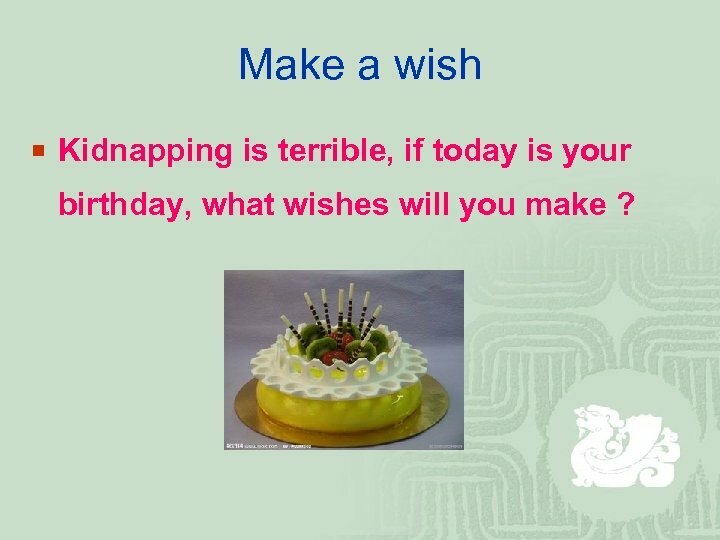 Make a wish ¡ Kidnapping is terrible, if today is your birthday, what wishes will you make ? 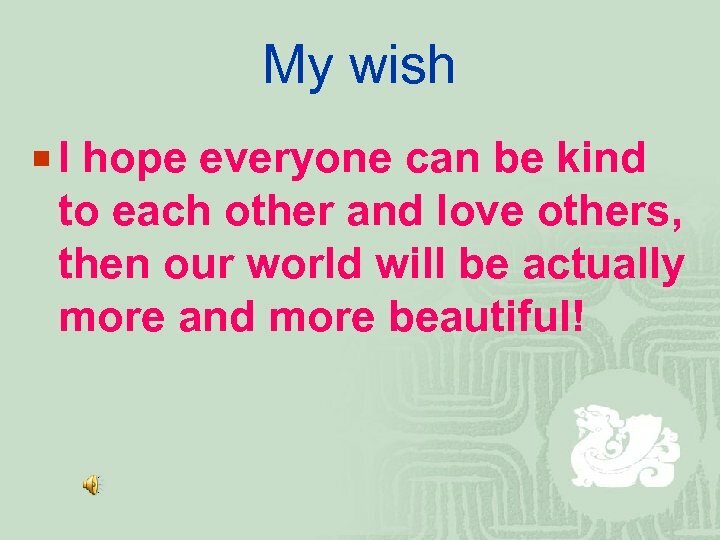 My wish ¡ I hope everyone can be kind to each other and love others, then our world will be actually more and more beautiful! 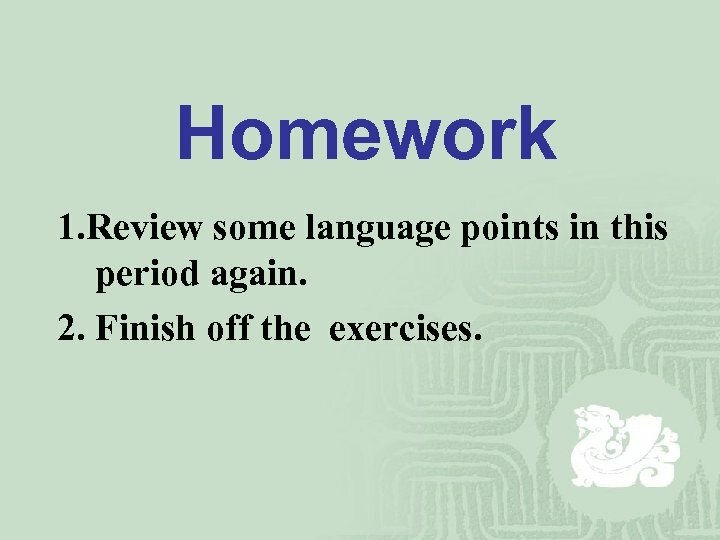 Homework 1. Review some language points in this period again. 2. Finish off the exercises.